The Grizzly company, based in Woodinville, WA makes all-natural type products for dogs, cats, and horses. Though of special interest to us, is the development and manufacture of Grizzly fish oil products for dogs. 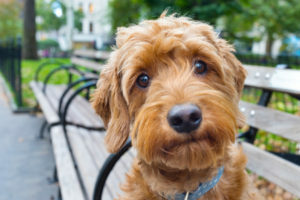 The products that Grizzly creates are based on the study and research documentation of the health benefits of daily fish-based supplements, especially for dogs. Fish oil, derived from Alaskan fish, contains healthy omega-3 fatty acids. 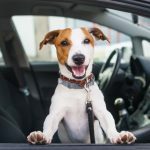 Fish oil supplements are beneficial for dogs in several ways. 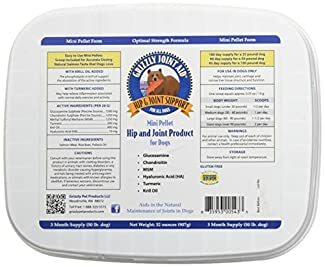 Grizzly Pet Products Krill Oil, 8 oz. Grizzly Pet Products Pellet Joint Aid for Dogs, 32 oz. Each bottle of Grizzly Pet Products Krill Oil for Dogs contains 8 fluid ounces of product. Ingredients are 76mg of Omega-3 Lipids, 17mg of Omega-6 Lipids and 900mg of Astaxanthin. The main chemical ingredient in fish oil, Astaxanthin is a naturally occurring carotenoid pigment that’s found in many fish and is said to be one of the most powerful antioxidants found in nature. 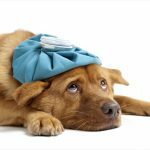 Fish oil aids the dog’s immune system to fight against free radicals. 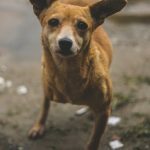 Free radicals are generally harmful to humans and dogs. The product is made from Antarctic Krill. We give Grizzly Pet Products Krill Oil for Dogs a thumbs-up and our highest FIVE STAR ranking! Each bottle of Grizzly Alaskan Salmon Oil contains 16 fluid ounces of product and contains 100% salmon fish oil. The ingredients include over 15 beneficial Omega 3, Omega 6, and Arachidonic fatty acids. The flavor, of course, is fish. The pump bottle allows the dog owner to pump the correct amount of fish oil directly onto or into your dogs food. There is a chart on the bottle explaining the amount to use depending on the dogs weight and size. There are other sizes of bottles, though this, in our opinion, is the most economical for the product. If unsure, we would recommend purchasing the smaller 4 ounce bottle. 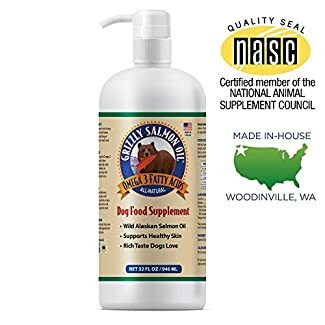 We give Grizzly Wild Alaskan Salmon Oil our ranking of FOUR STARS. This review is for 2 packets of Grizzly Super Treats Crunchy Training Treats Smoked Salmon. Each packet contains 5 ounces of small crunchy treats. 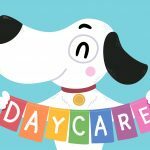 The treats do not contain added grains, fillers, salts or sugars. The ingredients are salmon meal, salmon, smoked salmon, salmon oil, porcine gelatin, kelp and Tocopherols as a preservative. Since these treats contain fish oil, they are an excellent healthy substitute for other less healthy training treats. Though we like the product, since they are baked and rather small and crunchy, they sometimes arrive rather broken up and smaller than we would like. And being made from a fish product, they do smell of fish. We would recommend using gloves when handling the product. 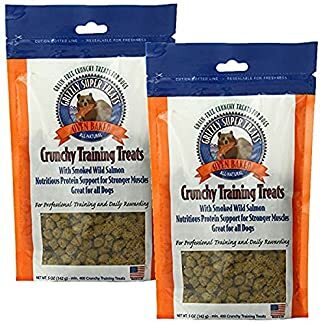 We give Grizzly Super Treats Crunchy Training Treats Smoked Salmon a FOUR STAR star rating. The Grizzly Pet Products Pellet Joint Aid for Dogs product comes in a 32 ounce tube. The product consist of small pellets to add to your dogs food. The pellets contain the following active ingredients – 1500mg of Glucosamine, 1250mg of Chondroitin, 1250mg of MSM, 100mg of Krill Oil and 10mg of Hyaluronic Acid. 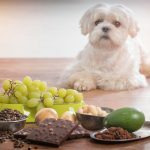 These ingredients are said to aid in the canines hip and joint health. The Grizzly Pet Products Pellet Joint Aid for Dogs product gets our exclusive THREE STAR rating. 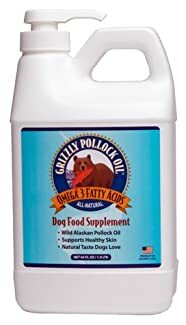 The Grizzly Pollock Oil Supplement for Dogs contains 64 fluid ounces within a pump bottle. Most fish oil products, including those from the Grizzly company, are made from salmon oil – however, this product is made from the pollock fish. Unlike other fish the pollock has less of a “fishy” smell. Unlike other fish oil products, this is NOT salmon oil, but Pollock oil. This fish oil is said to have less (or no) “fishy” smell or taste. This oil, just like that from salmon oil, contains Omega 3 fatty acids, EPA and DHA in ratios and amounts comparable to salmon oil. This is a great alternative to salmon fish oil products. We the Grizzly Pollock Oil Supplement our highest FIVE STAR rating.